After exhausting all internal remedies available, as the UHA was obliged to before it could take action, UHA has now been able to institute proceedings against, amongst others, the Minster of Environmental Affairs, Mrs Edna Molewa, the Director General, Department of Environmental Affairs, the Head of Department KZN: Economic Development, Tourism and Environmental Affairs and Ethekwini Municipality, not only reviewing the Minister’s decision to conditionally relax portion of the suspension decision, but compelling the National and Provincial Departments of Environmental Affairs to take action against EnviroServ to remedy the ongoing pollution, including making directions regarding the need for proper reliable monitoring, full capping and efficient, effective gas extraction and destruction. We have asked the Court to compel the Minister to consider revoking EnviroServ’s license for breaching the obligations resting upon it and the terms of the compliance notice issued in October 2016. Relief against the Municipality includes an order interdicting it from issuing EnviroServ with the Scheduled Trade Permit necessary to trade from the premises and for an order declaring that the land use by EnviroServ of the Shongweni premises for the purposes of conducting its waste management activities, is not a permitted use. Yesterday evening, 6th February 2018, the UHA also filed its replying affidavit in the civil interdict proceedings. 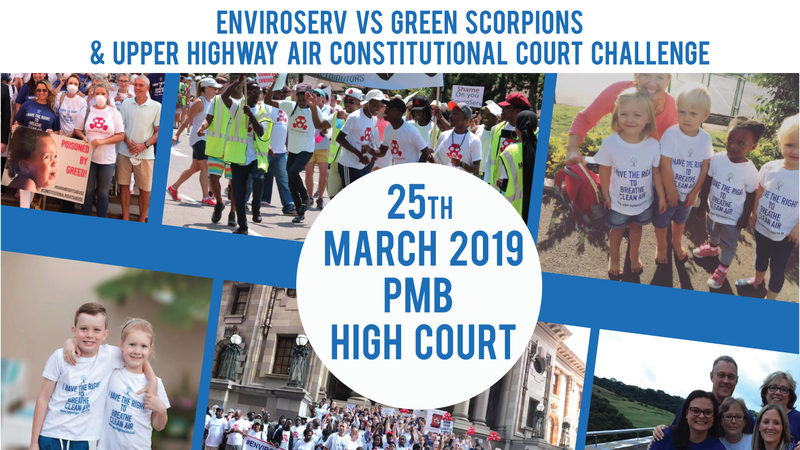 EnviroServ’s refusal to release the monitoring data from its 3 community monitors still constitutes an interim fight barring the final determination of that matter. Given the findings of our brilliant experts (there are 5 on record dealing with Air Quality, landfill engineering and now the gas extraction and destruction system), it is evident that EnviroServ’s monitoring devices are incapable of reliably monitoring the air pollution impacting the communities and the data which the analysers did yield was misrepresented to the Minister. The DEA did have access to this data and presumably showed the Minister but she chose instead to accept EnviroServ’s scientifically and factually flawed (mis)interpretation of the data. It is also apparent from the evidence produced by EnviroServ (after being compelled to do so by UHA) that there is no evidence that the flare is working. It is clear also that the ruse of the mystery polluter has been the game plan all along. We will over the next few days continue to share the details and views of our experts which are set out in the papers filed. For now we would like to thank our experts and legal team for all the late nights and hard work in getting to the truth and presenting it to the Court and now the community, and for the restraint showed in the face of unwarranted, sometimes personal attacks on them by those few who might have thought the UHA was not being “proactive” enough. A timeline of all that UHA has done to bring the community to this point will be posted during the course of the day. It will not be exhaustive but a hint of what has been going on behind the scenes. For now we would like to express our sincere gratitude to Quentin Hurt of Skyside, Mark Wicking-Baird of Argos Scientific Africa, Dr Lisa Ramsay and Dr Jon Mcstay of WSP, Jon Pass of Wilson & Pass Inc, Dr Nadia Kahn, Bryan Grant of SkySide and the legal team at MacGregor Erasmus Attorneys for all their hard work and dedication, and Adv Alan Lamplough for his input and agreement to also assist going forward in the fight for clean air on a pro bono basis.